A couple weeks back I made a post about The Little Things in Saints Row the Third. I talked about some of the little things the game does to keep the player interested in the game. Well, I've now played most of what Saints Row the Third has to offer. I've completed all the story and DLC missions, and am sitting at 85% completion. Unfortunately looking at the game from this side of things paints a little bit of a different picture. So now that I'm situated where I am, I wanted to return to the topic to talk a bit about how the wonderful little systems in Saints Row work (or don't) in the "end game". One of the things that I talked at length about in the aforementioned post, was the game's respect system. It did a very good job of making even the most mundane tasks both fun and productive by awarding you "Respect" for doing zany things. This is still true, but it's not something that lasts forever. As you could probably surmise, there is a maximum level of Respect that you can reach. Respect is used to unlock the ability to purchase upgrade, not to purchase the upgrades themselves. Therefore, once you reach max Respect level, Respect is no longer useful. Not unsurprising, but it's amazing how much less fun everything is when you finally catch that carrot on a stick. I would say that perhaps Respect should have been used to buy upgrades, but the way money works in this game is important to it's feel. Without purchasing upgrades money wouldn't have a whole lot of use, so it's hard to say which would be better. Unfortunately however, the problems with the game's Respect system arise even before you hit Respect level 50. As you can probably surmise, as your level increases you need more Respect to achieve each successive level. The issue is that many of the "zany things" that incentivize the little actions in the game (getting headshots, chain kills, driving in the oncoming lane) don't award that much Respect. As your respect level goes up, the point to doing these small but fun things goes away. It becomes more efficient to just get from point to point as quickly as possible, because when you get there you will be greeted by big booms and lots of mission completion Respect. Certainly if you can drive in the oncoming lane to get to your destination, some Respect is better than none. It ultimately feels fruitless though, and it takes a lot of the fun out of the experience of romping about the city. The game becomes about achieving objectives almost exclusively. I would say that perhaps Respect acquisition/requirements should be balanced differently. In the end of the day though, they made getting high respect levels accessible for any play style, which is probably more important. So that's all kind of unfortunate. It's not that unexpected though. Obviously you can't keep getting Respect forever, and obviously it shouldn't be balanced such that driving in the oncoming lane for a couple hours will get you to level 50 before you finish the first story mission. However I would say that what is more disappointing is the actual upgrades that it unlocks. The game does a really good job of making each Respect level matter. Pretty much every single level unlocks some awesome things that are legitimately quite desirable. Too much so, in fact. As your Respect level gets really high, things start to get a little bit too ridiculous. 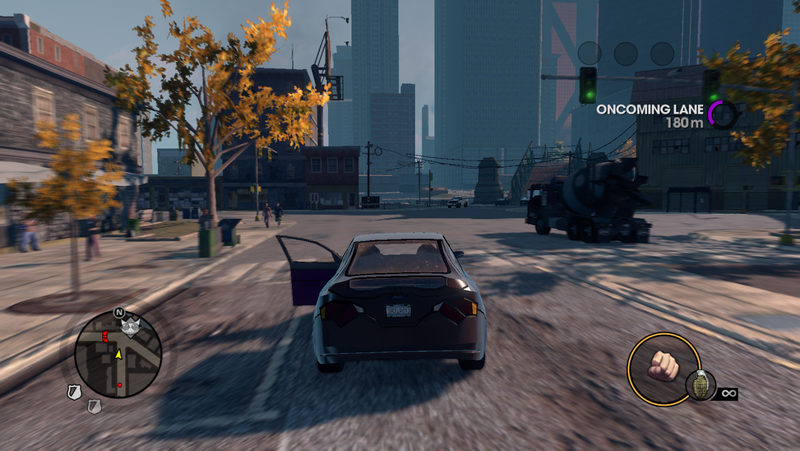 Now, ridiculous is kind of what Saints Row does. It's really cool having explosive pistols, incendiary SMGs, infinite run time, etc. The problem is when you start unlocking instant reloads, infinite ammo, and damage immunity. See what it comes down to here is that all of the fun has just been removed from the game. I don't get any real reward for doing anything (other than increasing that completion %), and doing most things is just boring. What's the fun in doing some big gang fight when I can use an automatic weapon without having to ever reload or worry about ammo, and I am completely immune to damage? Tense gang fights are fun. 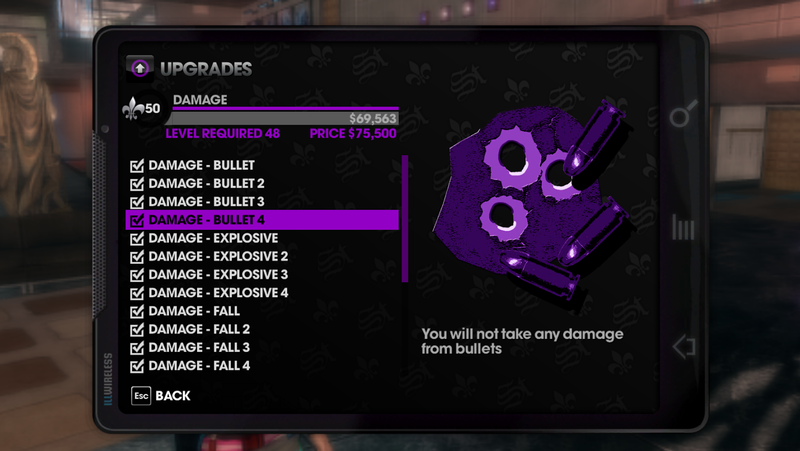 Upgrades likes 20% damage reduction from bullets are good, and pretty essential. Gang fights where I can stand in one spot and kill everything in sight with not a care in the world is just boring. Games are not fun if you can't lose, or at least have some form of failure state. It's cool when you are awesome, but Saints Row the Third took it too far. I would say that upgrades like immunity to fire, instant reload and no ragdoll from explosions are all good. They are adequately absurd, but you still have to worry about your ammo and health. Now that's not to say there is no fun left in the game. Plenty of the side missions involve challenges that are unrelated to your upgrades. How quickly you reload has little bearing on how good you are at driving a cyber motorcycle around fire. However the fact of the matter is I find it hard to motivate myself to continue playing the game now that I have achieved grand overlord status. If I could go back in time and un-buy that upgrade, I actually would. It's seems like a no-brainer to pick up such a powerful upgrade, but I would trade damage immunity for a fun game every time. Saints Row the Third was definitely fun while it lasted, but they should have stuck with 75% damage resistance.